Its great having paypal payment integration built right into JotForm, but what if you want to give your customer other payment options such as paying by check? or even over the phone? 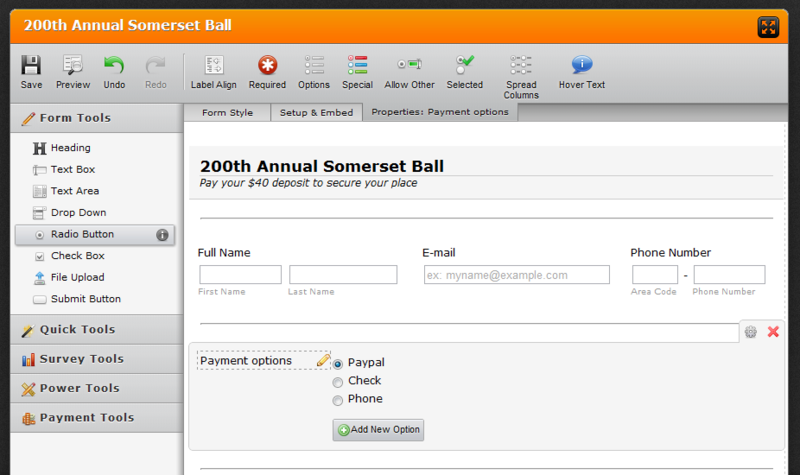 In this example we are hosting an event and attendees have to pay a deposit to secure their place. They will be given 3 options, pay by paypal, pay by check or pay over the phone. Lets start by building our form. I use the Radio Button in the Form Tools Menu to set up my 'payment options' field. Now I add each of my payment methods, one after the other.